"On her first widely distributed album and third overall, Morvan boasts a strong and limber voice, an affinity for bending notes on guitar and a flair for writing songs about such matters as lasting romance and the importance of perseverance. 'One Little Thing,' inspired by B.B. King, makes for superior pop-blues. This blond and blue-eyed Californian favors content over effect in her music. Morvan's band and guests, including George Duke, share her vigorous charm." "L.A.'s Laurie Morvan is a member of that still all-too-rare club of female lead blues guitarists. On her third release, Morvan shows strong chops on guitar and a good ear for writing accessible songs. The overall result is an easy-to-listen-to blues-rock hybrid, not so different from what better-known artists such as Robert Cray and Bonnie Raitt have been creating for the last few decades. While Morvan credits Stevie Ray Vaughan as a specific influence, her playing is far more reminiscent of former Roomful of Blues guitarist Ronnie Earl. It's got that Texas twang but with a jazz musician's restraint and even elegance. She's far more interested in playing well than in playing fast. Laurie Morvan plays Monday night at Humphrey's Backstage Lounge in San Diego." The 13th annual Blue Wing Blues Fest is an outdoor blues festival featuring some of the country's top blues artists in an intimate garden setting at the Tallman Hotel in Upper Lake, California. Laurie Morvan Band plays Saturday, August 31st, on Labor Day Weekend. Laurie will perform in Booth 8501 at 12 pm during the NAMM show, held at the Anaheim Convention Center in California. She will be demonstrating their 5.8 Gigahz Guitar Wireless system. 2018 FINAL - GRAVITY is #14 in the top 200! December 2018 - Laurie Morvan is featured in the book, "Women And Ideas In Engineering: Twelve Stories From Illinois"
A new book by University of Illinois alumna Angela Wolters and Laura Hahn highlights the stories of pioneering women in the College of Engineering. Laurie is honored to be featured in the chapter titled, "Do Engineers Have to Engineer?" which outlines Laurie's circuitous journey to the blues. The limited edition companion coloring book also includes a page showing Laurie playing guitar. Published by University of Illinois Press, 2018. For those interested in purchasing the book, it is available on Amazon. Over 60,000 views and 500 shares. "Laurie Morvan and her Fender Custom Shop resissue Strat show us the solo from her song, "My Moderation," then she walks us through her pedalboard and amp setup." "Also, check out our review of Laurie's new album, "Gravity," in the August issue. READ NOW!! bit.ly/2JiSz1K"
Laurie Morvan's Gravity CD has been nominated in Downbeat's 83rd Annual Readers Poll for Best Blues Album. Week of April 14 - Twice The Trouble is #2! Gravity is March's featured album of the month at WSGE 91.7 FM. Several Gravity songs are in regular rotation. Live interview with Laurie on Highway 321 Blues Radio Show March 8 10 am EST. Feb 2nd, 2018 at KTST FM – Anaheim Pic N Purple Show. 6pm - 8pm and later in Archives. Feb 4th, 2018 at 101.5 FM KOCI - KOCIRADIO.COM Dr. Barry's Traveling Medicine & Blues Show. 1pm - 3pm. To be held at Don The Beachcomber in Huntington Beach, CA at 8pm. Free gift with every presale ticket purchase. 12/14/17 - New CD GRAVITY release date is February 9, 2018. Blind Raccoon will be managing the Media and Radio promotion. Burnside Distribution Corp. (BDC) will again handle CD distribution. This is Laurie's 6th CD. 8/1717 - Fresno Bee picks Laurie Morvan Band as a top entertainment choice this week. See the band at the Tower Theater Lounge in Fresno this coming Saturday. Read who else made the list. 6/6/17 - Laurie Morvan Band to headline Acre of Blues Fest in Eureka, CA on Sept. 2, 2017. 4/11/17 - Laurie starts recording new CD at Ultratone Studios with producer/drummer Tony Braunagel. 3/11/17 - LMB headlines Colorado River Blues Festival. 1/1/17 - Tony Braunagel set to produce new LMB CD. 3/5/16 - Laurie Morvan Band plays Blues Blast in Phoenix, AZ. 2/7/15 - Laurie Morvan Band plays Boogie, Blues and Brews in Yuma, AZ. 6/5/14 - Pasadena Weekly feature article says LMB is "Red-Hot Blues". Visit the Press Page to read the full article. 6/1/14 - Beautiful new design for Laurie Morvan Band t-shirts. The shirts come in men's and women's sizes M-XXXL and are available in the LMB Store. Also added to the show are guest appearances by Eric Sardinas and Rod Piazza, appearing with Papa J and the Double Down Blues Band! 6/29/13 - Laurie Morvan on front page of News-Gazette. The LMB performance at the Champaign Blues, Brews and BBQ Fest was so well-received that the News-Gazette featured Laurie on the front page of the paper the next day. See the front page of the paper. 6/20/13 - "Laurie Morvan a charismatic performer whose stage presence is both powerful and inviting." The Daily Journal in Kankakee, IL featured glowing reviews of the Laurie Morvan Band's 2012 performance and spotlighted their upcoming 2013 performance at Friends of the Blues. Read more about the feature article in the Daily Journal on Laurie Morvan Band. 6/7/13 - Laurie Morvan on the cover of Southland Blues Magazines. Prior to heading out on the Laurie Morvan Band's summer tour, Laurie talks about her unique style of song writing and her hopes and plans for the band. Read the cover story feature article on Laurie Morvan. 2/1/13 - LMB advances to semi-finals at the IBC. The Laurie Morvan Band completes 2 nights of competition in Memphis, TN and will now advance to the semin-finals at the New Daisy Theatre. 10/10/12 - LMB heads out on first European Tour. The Laurie Morvan Band tour schedule includes shows in Holland and Luxembourg. Visit the Calendar Page for more information. 9/29/12 - LMB to represent Santa Clarita Valley Blues Society at the 2013 International Blues Challenge. The Laurie Morvan Band will compete against bands from around the world at the "Biggest Event in Blues" put on by the Blues Foundation. Visit www.blues.org for more information. 9/4/12 - Laurie Morvan Band welcomes drummer Lonnie Jones to the band. 12/12/11 - Breathe Deep advances in Blues Foundation Competition. 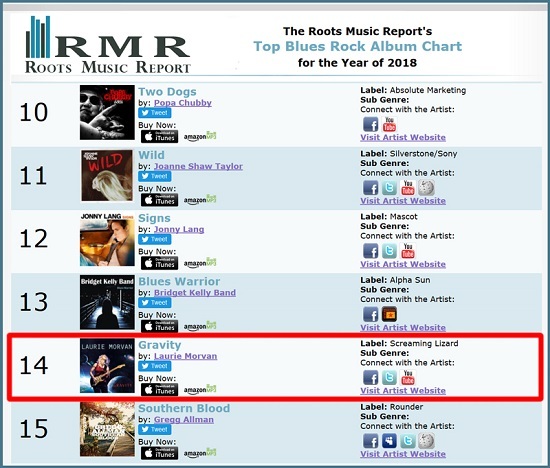 The Blues Foundation announced that Breathe Deep by the Laurie Morvan Band is among the Top 30 CD's to advance to Round 2 in their Best-Self Produced CD competition. This year's competition is the largest ever, starting with 74 nominations from blues societies around the world. It culminates with the winner being announced at the Orpheum Theater in Memphis on February 4, 2012, during the International Blues Challenge. See the Top 30 list here. The LMB's fourth release, Fire It Up!, won this competition in 2010, and their third release, Cures What Ails Ya, was a Top 5 finalist for the award in 2008. 7/17/11 - Laurie Morvan Band invited to perform on Legendary Rhythm & Blues Cruise. The good folks at the Legendary Rhythm & Blues Cruise announced that they have selected the Laurie Morvan Band as the winner of their Sonicbids competition for a spot on the October 23-30, 2011 Pacific Cruise sailing out of San Diego to Cabo San Lucas, La Paz & Loreto. Featuring 11 songs penned by Laurie Morvan, Breathe Deep is the follow up to the band's highly acclaimed 2009 release, Fire It Up!, which won the 2010 Blues Foundation Award for Best Self-Produced CD. 8/1/10 - DownBeat Magazine is diggin' Fire It Up! click here to read DownBeat review of Fire It Up! 7/30/10 - LMB now holds all-time record for CD sales! Over 2400 fans were rockin' with the Laurie Morvan Band during their 2 1/2 hour show at Robertshaw Amphitheater on 7/30/10. Their show was part of the SummerSounds concert series which has been held in the city of Greensburg, PA for the last 10 years. The LMB completely won over the all ages audience and now holds the all-time record for CD sales at this event. 3/1/10 - Fire It Up! enters Living Blues Radio Chart at #9. After winning a 2010 Blues Foundation Award, Fire It Up! now conquering the radio charts. 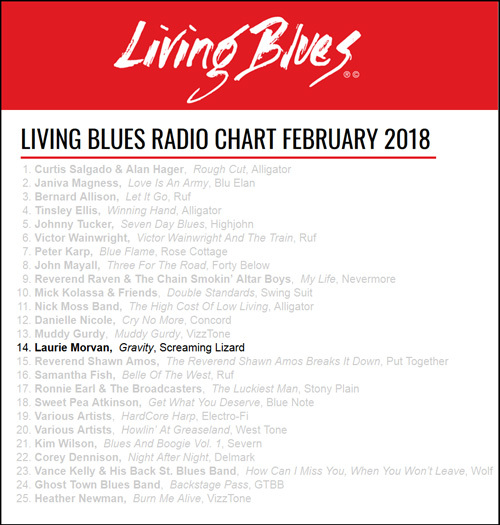 Living Blues magazine announced in its April issue that the Laurie Morvan Band's latest CD jumped right into the Number 9 spot on their February 2010 Radio Chart. Feb. 2010 Living Blues Radio Chart. 2/19/10 - National TV Special on Laurie Morvan Band to air! 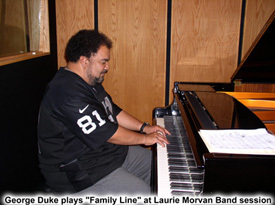 The Big Ten Television Network is set to air a 30 minute special, titled “Laurie Morvan Band: Nothing But the Blues”, on February 19, 2010 at 1:00 pm CST (11:00 am PST). The show was filmed during the prestigious Ellnora Guitar Festival held at the Krannert Center for the Performing Arts on the campus of the University of Illinois in Urbana-Champaign this past September. This national TV special includes live footage of the Laurie Morvan Band’s festival performance and an interview with Laurie Morvan. Check your local listings to verify the time and set your recorder! 1/23/10 - Blues Foundation announces Fire It Up! wins award for 2010 Best Self-Produced CD at the International Blues Challenge. The International Blues Challenge has been dubbed the "biggest event in blues". You can read about all the winners of this year's competition at the Blues Foundation's website. 12/18/09 - Blues Foundation announces Fire It Up! is a Finalist for Best Self-Produced CD (Top 4). Fire It Up! by the Laurie Morvan Band is now a finalist (Top 4 in the world!) in the Blues Foundation's competition for Best Self-Produced CD. The winner will be announced at Solo/Duo Finals on the Orpheum Theater stage in Memphis, TN on January 23, 2010 as part of the International Blues Challenge. 12/10/09 - Blues Foundation announces Fire It Up! is a Semi-Finalist (Top 12). Fire It Up! by the Laurie Morvan Band is now a semi-finalist in the Blues Foundation's worldwide competition for Best Self-Produced CD. The winner will be announced at the International Blues Challenge in Memphis on January 23, 2010 . 12/1/09 - Laurie Morvan on the cover of Big City Blues magazine. Laurie is joined by Susan Tedeschi, Fiona Boyes, Roach of Cafe R&B, CookieThreatt, Taryn Donath. The photo was taken while all the ladies were performing on the Legendary Rhythm & Blues Cruise. 11/1/09 - Elmore Magazine asks "Where Are The Girls With Guitars?" Jim Hynes features Laurie Morvan's lyrics in an article spotlighting female guitarists. Visit the Press Page for more. 10/28/09 - Santa Clarita Valley Blues Society declares"Fire It Up!" CD winner. CD advances to next round of the Blues Foundation's Best Self Produced CD competition. 10/20/09 - Laurie Morvan Band "Fire It Up!" CD National release. Distributed nationally by Burnside Distribution Corporation for retail store orders. Downloads available at iTunes and Amazon. 8/31/09 - Laurie Morvan Band "Fire It Up!" CD now available! Visit our Online Store to get your advance copy of the new CD right now. Stay tuned for more news. 6/6/09 - Laurie Morvan steals the show at Coloma Blues Live! "Kenny Wayne Shepherd, Joe Louis Walker, Rick Estrin, Mighty Mike Shermer and Laurie Morvan burned down Henningsen Lotus Park on Saturday...Rock-tinged blues guitars ruled the day. Many attendees felt that Morvan, who opened the show, also stole it. The clear-eyed former athlete brought guns to rival Michelle Obama, and proceeded to bend them around her Fender Stratocaster in a scorching set of original blues rock that left the early arrivals staggering to the CD sales booth. 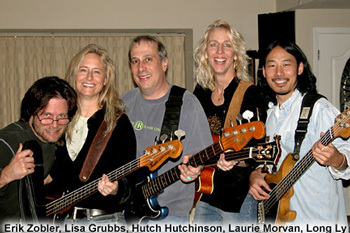 4/17/09 - Laurie Morvan Band to play Ellnora Guitar Festival! The bi-annual event takes place at the prestigious Krannert Center for the Performing Arts at the University of Illinois in Champaign, IL on September 12, 2009. Other featured artists on the festival include Derek Trucks and Keb Mo'. March 2009 - Laurie Morvan feature article in Illinois Alumni Magazine. Read the feature article on Laurie Morvan in Illinois Alumni Magazine. Jan & Feb 2009 - Laurie Morvan Band recording 4th CD! 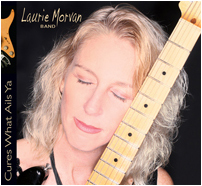 The Laurie Morvan Band expects to release a new CD this Spring featuring 12 songs all written by Laurie Morvan. Laurie is co-producing the CD with Steve Savage, whose producing/engineering credits include Elvin Bishop, Robert Cray, Tommy Castro, John Hammond and others. Several of the CDs Steve has worked on have gone on to receive Grammy nominations, including a 2009 Grammy nomination with Elvin Bishop. 10/3/08 - Catalina Island Blues Festival fans love Laurie Morvan! The front page of the Catalina Islander featured a review of the 2008 Catalina Island Blues Festival and spotlighted Laurie Morvan as one of the major highlights of the entire festival, putting her picture front and center! Festival headliner Buddy Guy put on a great show, but the blues festival fans really connected with Laurie and took her into their hearts. Read more about Laurie in the Catalina Island Blues Festival. 7/25/08 - Laurie Morvan on cover of Entertainment Guide in Champaign, IL News-Gazette . University of Illinois Alum Laurie Morvan graced the cover of Champaign's major newspaper in celebration of her upcoming concert there. See the Press Page for this feature as well as other articles and reviews from theLMB's Summer 2008 Midwest Tour. 5/2/08 - Laurie Morvan named "2008 Blues Artist on the Rise" by Blues Festival Guide magazine. The Laurie Morvan Band competed against more than 230 other groups and was crowned "2008 Blues Artist on the Rise" in a competition sponsored by the Blues Festival Guide. 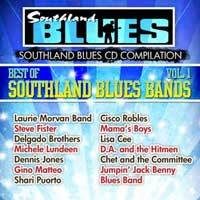 4/3/08 - Laurie Morvan Band selected to be on Best of Southland Blues compilation CD. The CD features the best of southern California blues bands and is a joint venture between southland Blues Magazine and Grand Entertainment. 4/1/08 - Article written by Laurie Morvan is published in Big City Blues Magazine. Written from the musician's perspective, Laurie's article gives you insight into what it's like to be a performer at the International Blues Challenge. Read Laurie Morvan's article about the IBC. Brian D. Holland of Modern Guitars Magazine has written an excellent feature article on Laurie Morvan to go along with his June 2007 interview of her. Not only did Brian do a great job of researching Laurie's music, we commend him for taking the time to really "get it". You can go over to the Modern Guitars website and read the article to find out all kinds of great info about Laurie you may not have known. 2/26/08 - Laurie Morvan Band selected to open 2 shows for legendary blues artist John Mayall & the Bluesbreakers. The Laurie Morvan Band will perform 4/17/08 at the Coach House in San Juan Capistrano, CA and 4/18/08 at the Canyon Club in Agoura Hills, CA with John Mayall & the Bluesbreakers. John Mayall is a powerful blues performer and has a knack for working with the world's top musicians: Eric Clapton, Mick Fleetwood, John McVie, Peter Green, Walter Trout, Coco Montoya, Jack Bruce have all played in the Bluesbreakers. Visit the Calendar Page for show details. 2/2/08 - Laurie Morvan Band a 2008 FINALIST at International Blues Challenge and a 2008FINALIST for "Best-Self Produced CD". The Laurie Morvan Band was the only group that advanced to both finals and was #2 in CD sales at the IBC (out of all 160 acts)! Essential: What To Watch For This Week "
Read San Diego Union Tribune's article about the Laurie Morvan Band. 12/13/07 - Los Angeles City Beat magazine picks Laurie Morvan as Critics Choice ... "This woman has something special." Read Kirk Silsbee's article about Laurie Morvan in LA City Beat magazine. 12/18/07 - Blues Foundation announces Cures What Ails Ya is a Top 5 Finalist for prestigious "Best Self-Produced CD" award! 12/6/07 - Blues Foundation announces Top 10 Semi-Finalists for prestigious "Best Self-Produced CD" award...Cures What Ails Ya is in! The Santa Clarita Valley Blues Society announced today that their entry for the Blues Foundation's "Best Self-Produced CD" award, Cures What Ails Ya by the Laurie Morvan Band, is now a Top 10 Semi-Finalist in the competition. The winner will be announced during the International Blues Challenge held in Memphis, TN from January 31 through February 2, 2008. Oct. 25, 2007 - Cures What Ails Ya nominated for Blues Foundation's "Best Self-Produced CD" award. The Santa Clarita Valley Blues Society announced that they have nominated Cures What Ails Ya by the Laurie Morvan Band for the prestigious "Best Self-Produced CD" award sponsored by the Blues Foundation. The winner will be announced during the International Blues Challenge held in Memphis, TN from January 31 through February 2, 2008. Laurie Morvan, Tommy Castro and Ronnie Baker Brooks traded solos to thunderous applause at the Legendary Rhythm & Blues Revue held at the Coach House in San Juan Capistrano. See photo of Laurie Morvan, Tommy Castro, Ronnie Baker Brooks. October 6, 2007 - Laurie Morvan Band wins regionals and will head to Memphis for the semi-finals of the International Blues Challenge! The LMB will proudly represent the Santa Clarita Valley Blues Society in blues biggest event of the year! For the 24th year, Blues musicians from around the world will compete for cash, prizes, and industry recognition as The Blues Foundation presents the 24th International Blues Challenge beginning January 31 and continuing February 1-2, 2008 in Memphis, TN. The world's largest gathering of Blues acts represents an international search by The Blues Foundation and its Affiliated Organizations for the Blues Band and Solo/Duo Blues Act ready to take their act to the international stage. To find out more click here. Read a feature article and see full color photos of Laurie. See the Press Page for details. Laurie Morvan's song 'Family Line' from the 'Cures What Ails Ya' CD was named Best Song at the Winery Music Awards. 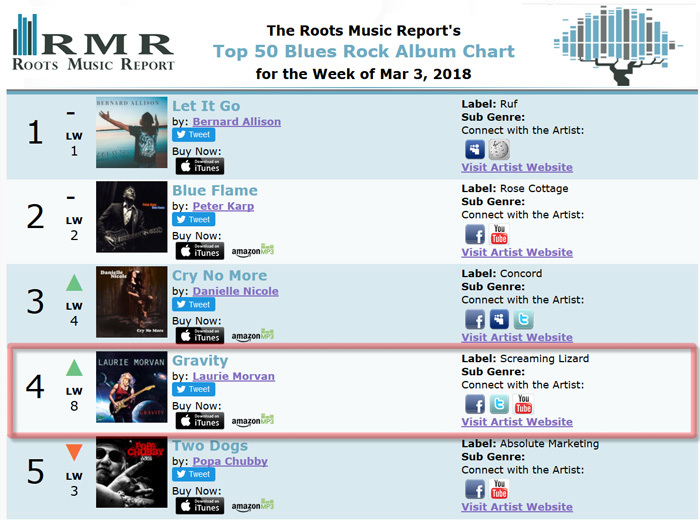 Cures What Ails Ya by the Laurie Morvan Band spent 12 weeks on the Roots Music Report Blues Chart. July 7-8, 2007 - LMB on House of Blues Radio Hour w/ Dan Akroyd! Laurie Morvan's song, "Kickin' Down Doors," has been selected as the "Blues Breaker" song of the week for the nationally-syndicated "House of Blues Radio Hour" show that will air the weekend of July 7/8. The HOB Radio Hour airs on over 100 stations across the US. The song will air in its entirety, preceded by some fine words about Laurie and the new CD from Elwood Blues, himself, (Dan Aykroyd)! June 20, 2007 - Laurie interviewed by Guitar Player and Vintage Guitar! Visit the Press page to find out when all the interviews will be published. June 2007 - "Cures What Ails Ya" CD getting rave reviews! The reviews of the new Laurie Morvan Band CD, "Cures What Ails Ya" are all overwhelmingly positive! Visit the Press Page to read them for yourself. June 12, 2007 - "Cures What Ails Ya" CD available in stores across the USA! You can buy it right here with FREE SHIPPING in the USA! April 23, 2007 - "Cures What Ails Ya" CD now available on iTunes! Laurie Morvan Band fans can now purchase the band's 2007 release, Cures What Ails Ya, in digital download form through iTunes. Two previous releases are also available: Find My Way Home and Out Of The Woods. April 13, 2007 - "Cures What Ails Ya" CD Release Party! Join the LMB to celebrate the release of their brand new CD, "Cures What Ails Ya". 8 :30 - 10:00, purchase CDs and meet the band for autographs, pictures and conversation. 10:00 - closing, the LMB will be rockin' the house with original red hot blues rock! The location is the Arcadia Blues Club, 16 E. Huntington Dr. , Arcadia, CA. 626-447-9349. 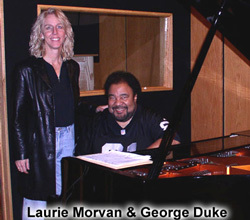 Grammy award winning pianist and producer George Duke. 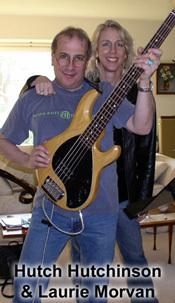 Grammy winner bassist Hutch Hutchinson (Bonnie Raitt band). Grammy winning drummer Tony Braunagel (Bonnie Raitt, B.B. King, Coco Montoya, Taj Mahal, Buddy Guy, John Mayall & the Blues Breakers). B3 organist extraordinaire Sammy Avila (Walter Trout band). Mastering engineer John Vestman (Sting, Ambrosia, George Duke, Juice Newton, Courtney Love, The Monkees). Visit the Calendar Page for more details. April 8, 2007 - Laurie Morvan named "2006 Female Artist of the Year"
Blues guitarist/vocalist/songwriter Laurie Morvan was named "2006 Female Artist of the Year" by the Blues Marketing Network. The announcement was made on Sunday, April 8, 2007 at an invitation only awards ceremony held in Long Beach, CA. Blues Marketing Network is an organization of blues musicians, promoters, venue owners and other professionals devoted to promoting the commercial success of all styles of blues and blues rock. Led by the unwavering enthusiasm of founder Jeremiah Plummer, the group members network their talents, assets and energies to bring their music to the attention of the music buying public and to increase awareness and interest in the blues in the general population. The focus of the network is to bring blues industry professionals together as a marketing community: that blues venues are not separate from blues musicians, blues promoters are not separate from blues fans, we are all on the same team. That working together, sharing successful ideas and strategies, cooperating with and encouraging each other, offering help and support, will benefit the art form we all love so much...THE BLUES! 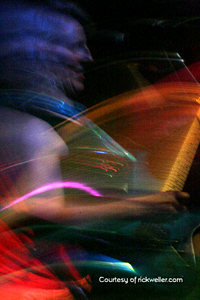 The Laurie Morvan Band website was also honored with the title of "2006 Best Website". 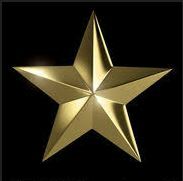 National publicity for the Laurie Morvan Band will now be handled by Mark Pucci Media out of Atlanta, Georgia. Mark has worked with the Allman Brothers Band, John Mayall, Marshall Tucker Band, Delbert McClinton, Lynyrd Skynyrd, Derek Trucks, Kenny Chesney, Maria Muldaur and a host of others. Both Mark and the LMB are looking forward to a very successful promotional campaign for the Cures What Ails Ya CD. March 3, 2007 - Laurie Morvan Band releases Cures What Ails Ya CD!! While the CD release party is scheduled for April 13, 2007, advance copies of the band's new CD will be made available at their performance at San Diego Indie Music Fest '07. January 2007 - LMB launches a new website! Erik and Long are the engineers working with the LMB on the new CD. May 10, 2006 - LMB's Find My Way Home CD charts!